This feature only available in Excel for Windows if you have Office 2019 or an Office 365 subscription. If you are an Office 365 subscriber, make sure you have the latest version of Office. 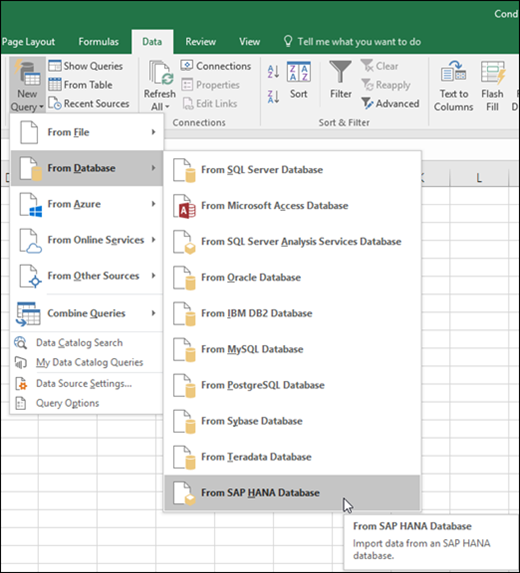 Before you can connect to an SAP HANA database using Power Query, you need the SAP HANA ODBC Driver on your computer. Select the driver that matches your Power Query installation (32-bit or 64-bit). You will need an SAP account to login to the website and download the drivers. If you are unsure, contact the SAP administrator in your organization. Click Data > New Query > From Database > From SAP HANA Database. In the SAP HANA Database dialog box, specify the server you want to connect to. The server name should follow the format ServerName:Port. Optionally, if you want to import data using native database query, click Advanced options and in the SQL Statement box enter the query. Click the Database tab, and enter your username and password.